One of the less heralded trends in Apple continuing revenue and earnings per share growth story is the recent and dramatic drop in operating expenses relative to revenue. 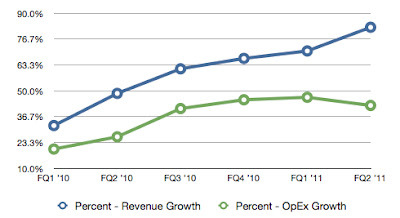 On December 21, 2010 I published a blog post titled Apple: Revenue Growth vs. Growth in Operating Expenses. Today I'm updating the data to include the first quarters of fiscal year 2011. What the numbers indicate is over the most recent three-quarter period revenue consumed by operating expenses (Research and Development and General, Selling and Administrative expenses) has dropped dramatically, contributing to a rate of growth in eps exceeding the rate of growth in revenue. I will provide a fresh analysis of Apple's rate of eps growth in an upcoming post at Posts At Eventide. The graph and table data above illustrate and detail the differing rates of growth of revenue and operating expenses over the most recent 10-quarter period. There's obviously some correlation between the growth operating expenses and revenue generation activity. The expansion of Apple's global product reach and the growth in the number of retail stores will naturally contribute to a rise in operating expansions. However, the company has managed to contain the rates of operating expense growth to levels well under the rate of growth in revenue over the past few quarters. Over the past three quarters in particular, the rates of growth in operating expenses relative to the rates of growth in revenue have had a more significant impact on the company's eps outcome than variations in gross margin. More accurately estimating Apple's operating expenses has been one of the key factors in the independent bloggers outperforming Wall Street analysts in the Apple 2.0 quarterly estimate comparisons. Over the next several quarters I expect the rates of growth in operating expenses to remain below the rates of growth in revenue due to Apple's ability to leverage the company's global retail store presence and the anticipated sharp rise in revenue from strong iPad unit sales. Robert, I find this post stimulating and fresh. As you correctly observe, this data is valuable in forecasting earnings. I also concur that having the blue line well below the green on a consistent basis is important for a company experiencing healthy growth. I'll make a further observation. If the curves are smoothed, the slope of the Expense line is significantly lower than the slope of the Revenue line. Just eyeballing it, but it looks like this is true for every quarter excepting the iPad launch quarter. Going forward it will be interesting to monitor both the 1st and 2nd derivative. The YOY benefit in the June quarter from the difference in growth rates between revenue and operating expenses could be at least $.40 per share based on an additional $.02 or more of each revenue dollar flowing to the pre-tax income line. The difference in the growth rates between revenue and operating expenses may continue to expand during FQ3 and FQ4 this year. Thanks for the nice chart. 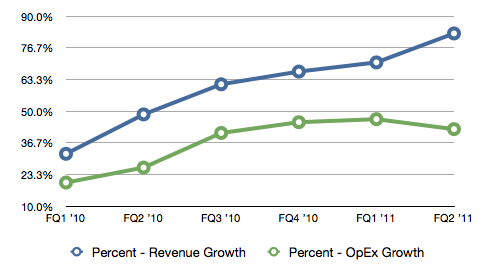 It might be quite interesting to add also the curve for the growth rate of the OpEx and Revenue guidance. This might provide some good handle for the current quarter. I was not able to post the above comment from Safari 5.0.5 under OS X 10.6.7, I had to switch to Firefox. Under Safari it always just reloaded the page with some strange red dot below the comment box. Adding a curve is an excellent idea. I may add that element to a future update of the quarterly data.